Faherty has become one of our favorite brands for their chill looks and comfortable, carefully chosen fabrics. Their vintage-inspired boardshorts, for example, easily made our list of summer favorites. This week, online retailer Huckberry has select Faherty pieces on sale, including some great picks for fall. Founded by twin brothers, Mike and Alex, Faherty draws on the brothers’ upbringing in New Jersey surf town of Spring Lake. They were drawn to both their father’s Italian suits and to vintage Hawaiian shirts, and the brothers have brought a love for quality fabrics and craftsmanship to their brand. Even if you can’t make it to the beach, Faherty’s relaxed styles will make you feel like you’ve never left. Here are five worthy picks from this week’s sale. As the fall chill chips away at the long, warm days of summer, slide into this cozy French terry shirt from Faherty. The Vintage Stripe Crew ($135) features natural dyed indigo stripe on a cream background. 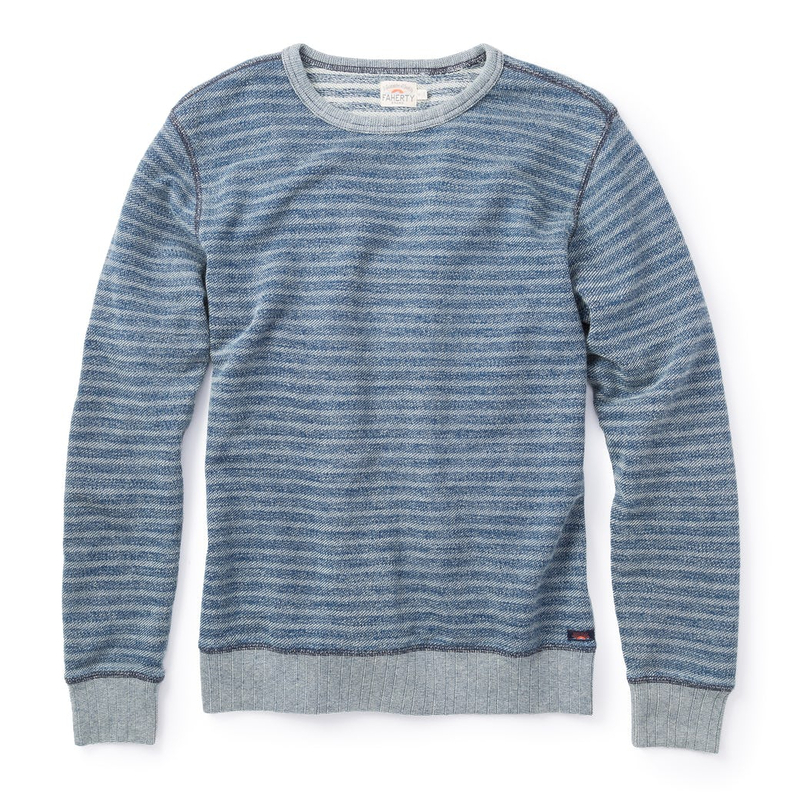 The crewneck is washed for had-it-forever comfort, while contrasting trim adds detail. The clean, minimalist look pairs with just about anything in your closet, from boardshorts to your favorite jeans. Wear it for beers with friends or to that last beach bonfire of the year. Linen is a miracle fabric for hot weather, thanks to its lightweight breathability. We also think it looks pretty fly in the hands of the right designer. 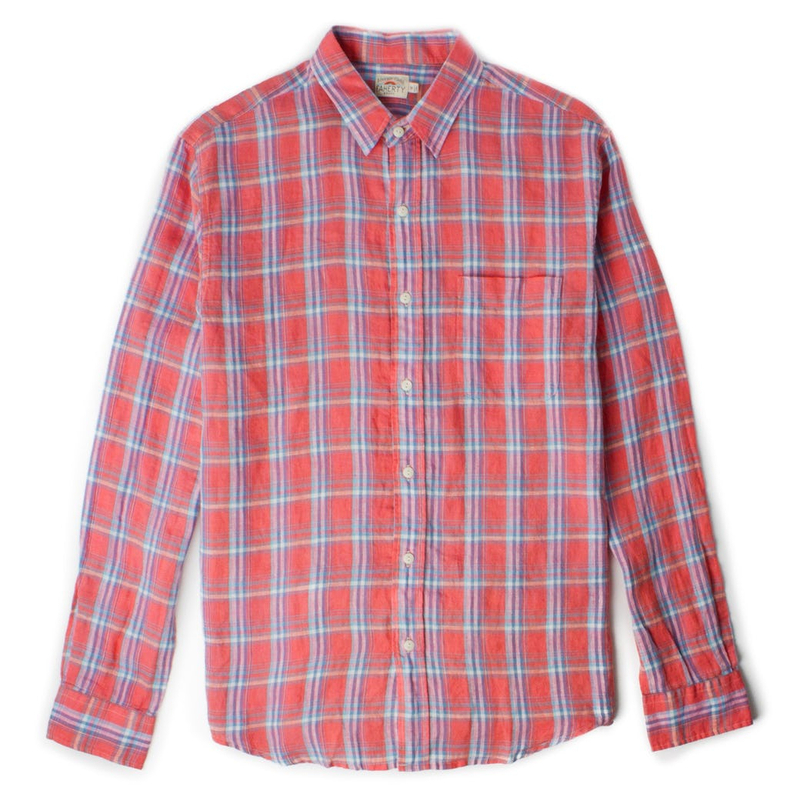 Faherty’s Ventura linen shirt ($142) features a classic plaid print in eye-catching coral. The Ventura is washed, so it’s soft against your skin, and has a faded, just-off-the-playa look. The seams are double-needle reinforced for durability. We love Faherty’s attention to detail, and the shell buttons here give the Ventura an extra touch of style. When it comes to hoodies, you can’t have too many in your closet. They’re an easy to wear, casual wardrobe staple. 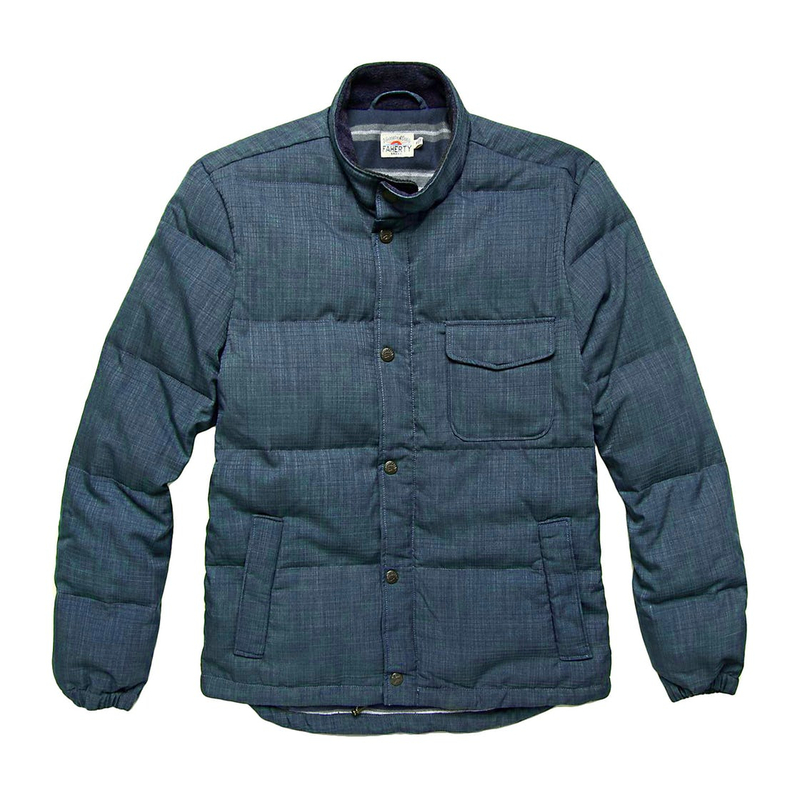 Faherty makes this Reversible Zip version ($168) from soft, brushed cotton fabric. Chambray seams trim the interior, while an antique Talon zipper gets the job done while blending smoothly with the striped chambray. 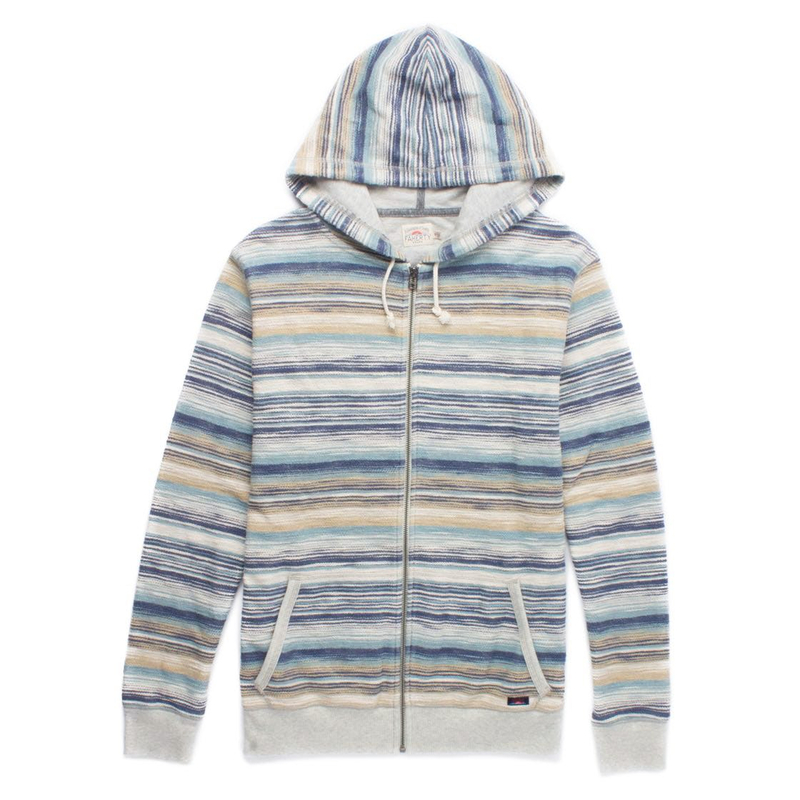 The Faherty brothers have collected an extensive archive of textiles, and this hoodie draws its inspiration the artwork of Native American handweavers. Wear it with light-wash jeans or a broken-in pair of chinos. The Belmar ($125) is two shirts in one, thanks to its reversible construction. One side is plaid flannel in Faherty’s Late Summer colorway that smoothly blends shades of blue, green, and red. 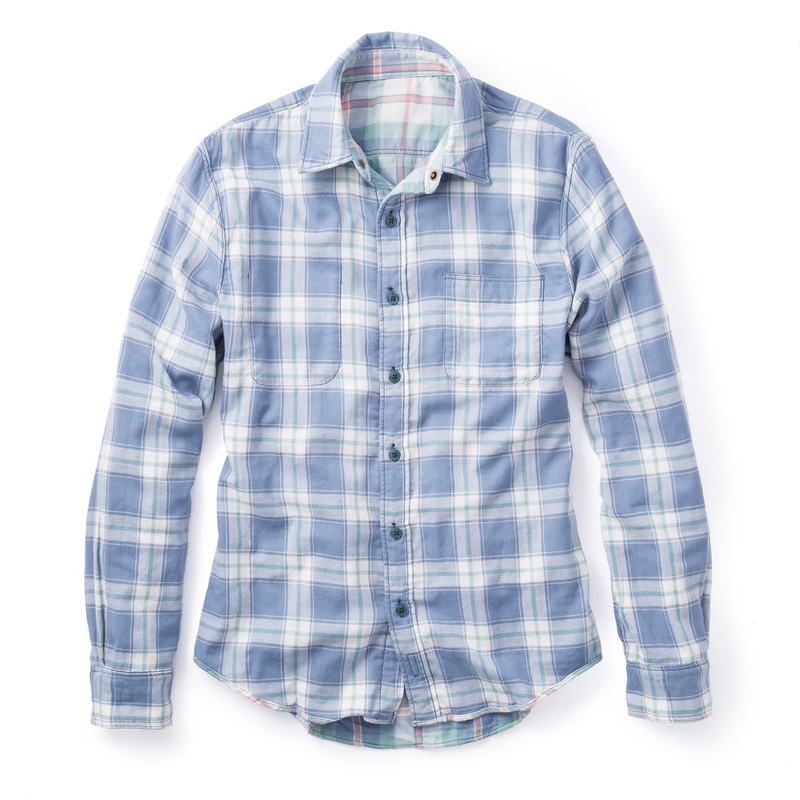 Flip the Belmar and a pale blue-checked Chambray (shown) appears. 2-ply yarn ensures this shirt will survive whatever adventures you have in store for it. Faherty washes the fabrics with softeners to give the Belmar a relaxed, lived-in feel. Corozo nut buttons add detail. Slack through the weekend or head to your favorite local bar, the Belmar is an easy to wear choice. Also available in Red Buffalo Check. We’re confident the Birdseye Crew will quickly become a wardrobe staple. The cool blue colorway and slub texture makes it an easy go-to. 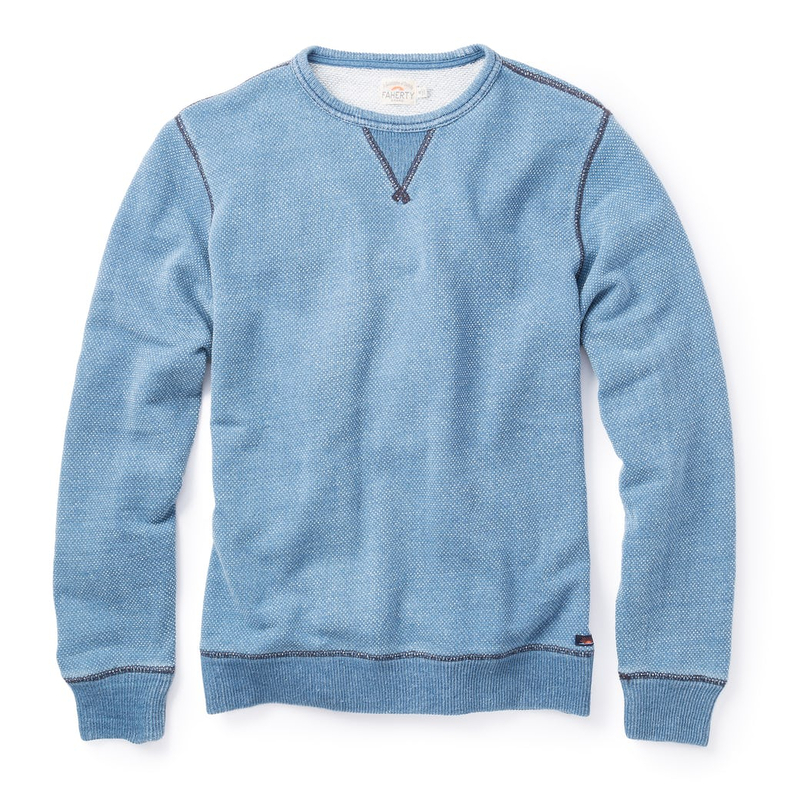 Faherty constructs the Birdseye Crew ($135) from indigo dyed yarn in a birds-eye knit. Two-tone rib detailing adds contrast and interest, and the pullover is garment-washed to avoid the uncomfortable stiff “newness” that clings to some shirts. The Medium Indigo Wash matches just about anything, so you won’t have to waste time worrying whether you’ve created a fashion disaster. Toss the Birdseye Crew over with some 365s and go do life. Nights around the campfire call for a warm coat, and the Down Jacket ($91, marked down from $300) is the perfect accompaniment to crisp nights. The weather-resistant shell combines with goose down insulation for ultimate coziness. It’s great for the slopes, too: The snap-and-zipper closure, fleece-lined collar, and elastic sleeve cuffs are perfect for keeping out rain and slush. Hurry — this jacket is almost sold out.